One of the items on my cooking-related list of resolutions for the New Year was to buy an ingredient that I was unfamiliar with and figure out how to cook with it. I didn't quite do what I set out to do, but I came up with a challenge that's pretty close in intent. Yesterday morning, I went to Borough Market, possibly for the last time, as I’m moving out of the country in just three weeks. My goal of the morning was to get a little tub of harissa from Borough Olives, but just across the way I noticed a spice vendor that I had never seen before. The stand sold a good number of ingredients that I’ve read about but have never actually used, like ras al hanout, fresh tamarind, ground pomegranate, and whole dried limes from Egypt. There was a spice from Thailand, powdery and gray-sand in color, that I had never heard of before (I already forget the name), and half a dozen specialty salts, the prettiest of which was an orange-tinted Basque chili salt. What I actually bought, though, is an ingredient that many people know well. I’ve seen many times before, have eaten it, but only know one major use for it: dried rose petals, primarily a garnish. Their only other common use that I know of is in teas. Any other food that’s rose flavored would most likely get it from rose water or syrup -- no? The container seemed to hold a good amount for a dainty little ingredient, and it only cost £1.50 (about $3 USD). 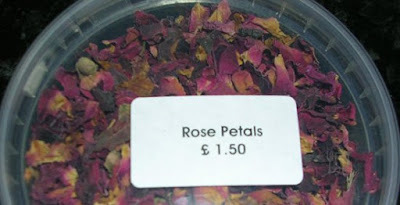 When I opened the lid, the fragrance was much stronger than I expected, floral, but not sickly so like potpourri. The challenge is to come up with a few inventive ways to use it. Jilleduffy’s Saturday morning milk ©. I’ve been toying with an idea in my head for something I’m going to call “Saturday morning milk ©,” The idea struck me while reading an article in The New Yorker about a chef who mentioned using “cornflake milk” in one of his recipes. I have no idea what cornflake milk actually is, but I imagined it could mean milk that has had cornflakes steeping in it. Some of today’s biggest groundbreaking chefs have learned how to use flavor, smell, and sight to conjure up memories of childhood. In this same vein, reading the words “cornflake milk” immediately made me realize how strong a memory sensation I have for milk that has been flavored with sugar sweetened cereals, specifically, Cap’n Crunch. “Saturday morning milk” would be a dessert course item: milk that has sat for at least an hour in a bowl of Cap’n Crunch -- but that’s not good enough on its own, I thought. There needs to be something mature about it, too. Maybe the milk could be steamed and frothed and served in lovely thin-lipped coffee mugs, on a saucer, with something cereal-esque on the side, like a tiny slice of Rice Krispy treat made with Cap’n Crunch, or sliced strawberry, or sliced banana – or better, a long slice of banana, slit so it rests on the edge of the coffee cup. Penne à la roses. I’d love to come up with a savory use for rose petals, too. How about penne a la vodka and rose petals, replacing the acidic tomato in the sauce with the more fragile rose pieces? Soup. Cream of celery and rose petal soup. Rosy seared tuna: Sesame and rose petal-crusted seared ahi tuna. Dressing: Lentil salad with steamed artichokes and rose petal vinaigrette. 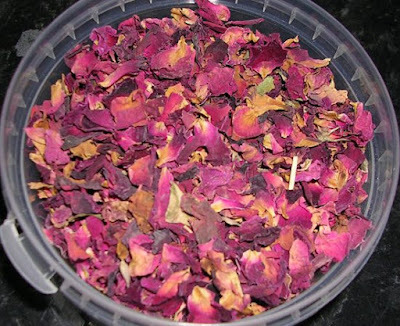 The trick with some of these theoretical dishes would be to steep enough of the dried rose petals in liquid to extract a palatable flavor, though I suppose you could always supplement a little rose water to get things going. Back on the sweeter side, how about rose petal, cranberry, and walnut bread? Or rose petal and lemon scones. Or muffins … with orange and rose petal marmalade (I found a recipe for rose petal jam -- pretty close). How about rose petal ice cream (it’s been done).